I think I have a problem. I've become such a tea snob. I'm obsessively collecting quality loose leaf tea. I now have a full cupboard with three shelves of air-tight tins containing my precious teas, plus two draws full of tea that I'm hoarding as well. The problem and the beauty of online shopping I can access tea from gardens around the world and have it shipped to my door. I realize that I don't need more, but I just can't stop myself. Why all the fuss? Well, my daily cup of tea helps to set the tone of my day. I love it, especially discovering a new blend or brand. 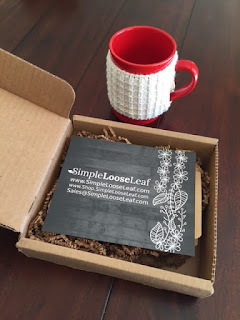 With my new obsession, Simple Loose Leaf Tea subscription box is like having a personal Tea Somalia in your mailbox doing the searching for you. Each month, a box of loose leaf teas is shipped to you to open and discover for just $11.99 per month. Each box has 4-5 loose leaf teas from around the world, 2 re-usable muslin tea bags and a beautiful card detailing the month's tea selection, which includes Black, Green, Herbal, Oolong, and more. In my latest shipment, I'm really enjoying their selected Jade Oolong and Japanese Sencha Green teas. Get 25% off your order by using code 25HOLIDAY. I'm becoming quite the tea enthusiast myself. ;) this is a really cool subscription box. I like that you get the chance to try out teas you may not have heard of or thought to drink. I bet you get some real unique teas!